AS YOU’VE PROBABLY heard, Ryanair has cancelled 50 flights a day over the next six weeks, causing problems for up to 400,000 of its passengers due to fly between now and the end of October. The cancellations, the airline says, are due to the switch the airline is making to its calendar year: from April – March, to the normal calendar year of January – December. At a press conference yesterday, Ryanair CEO Michael O’Leary said that a combination of factors had created the situation where Ryanair was forced to cancel so many flights. One of these reasons was increased holiday allocations to pilots and cabin crew (the others were weather conditions and air traffic control strikes). “I say sorry on behalf of Ryanair. We clearly messed up in our rostering department,” O’Leary said yesterday. But why are they making the switch in the first place? It’s mostly centred around a regulation that limits pilots to 900 flying hours per year (or 100 hours in 28 days). This is to avoid fatigue on one day and cumulatively, says the Irish Air Line Pilots’ Association (Ialpa). But there was a problem – Ireland’s calendar year is different to that in Europe, meaning that if pilots moved between airlines, there was a gap in calculating their total hours worked. “This could arise when a pilot who has completed 800 hours, for example, by December leaves Ryanair and commences flying in another European airline in January and accumulates another 300 hours by the end of March. This problem was brought to the attention of the Irish and European authorities on a number of occasions, according to Ialpa, as it had “obvious potential health and safety implications, with possible impact on flight safety”. So pilots rushing to book their annual leave at the end of the airline’s old calendar, and before the switch over to the new one, has partly caused the problem. Yesterday, O’Leary denied reports that the cancellations were caused in part by Ryanair pilots moving en masse to rival airlines. But Ialpa has cast doubt on this suggestion, saying that the timeframe of 6 weeks for cancellations suggests that staff shortages are somewhat to blame. RTÉ is reporting that Ryanair are to offer pilots compensation packages in place of their scheduled leave (although pilots would not receive the bonuses until October next year). Ialpa told TheJournal.ie that no offer had yet been made to their members. The cancellations, which will run on until the end of October, are estimated to cost the company around €25 million in compensation and loss of profits. The Irish Aviation Authority and Ryanair have been contacted for comment. 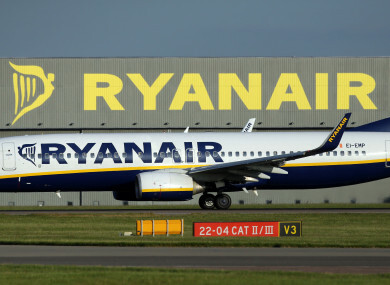 Have you been affected by the Ryanair cancellations? Email ryanair@thejournal.ie to share your story. Email “Flight cancellations: Why is Ryanair switching its calendar year?”. Feedback on “Flight cancellations: Why is Ryanair switching its calendar year?”.